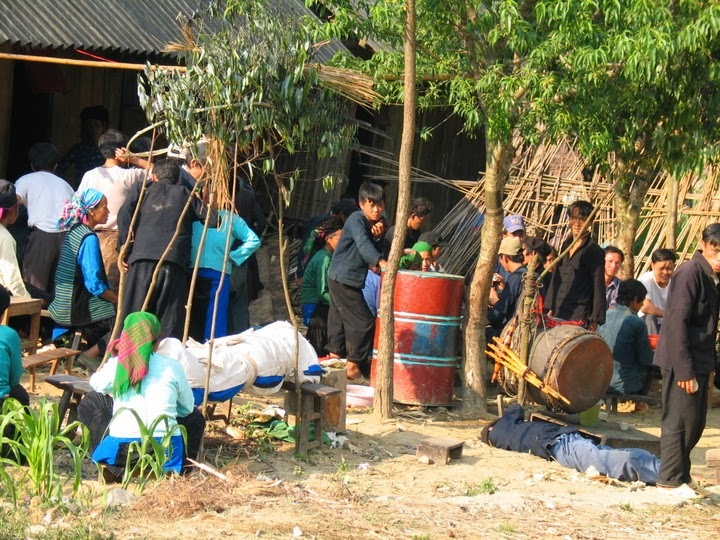 Like many other highland ethnic minorities, the Hmong in Sa Pa still preserved many traditional customs, including funeral is a ritual tradition, morality drinking water, remember its source, is the appreciation between the living and the deceased. When people give to earthly realm of the ancestors, the Mongolian known as “lean” or “Security Title” (the dead) is to follow the laws of nature. Based on the object and the cause of the deaths that Mongolia has held various funeral rites. For children who died less than three months old, the family held the funeral and buried when put to put through the wall, do not be put through the door. Parents and children to some is not crying fear of ghosts, ghost door know family will rebuke. As for the case of death outside the home such as: accidents, suicide, fall river, down stream, the Mongolian diet is never taken into the house of the funeral. Families will set up a shack outside beach venue for the funeral, because the Mongolian concept that those who die outside the home, largely due to the kind of evil that hurt, so when brought into the fear of ghosts back in the house to harm others in the family. The dead children, died in the house and accidental death are considered unusual deaths, so that the funeral is also more compact organization of the funeral of the dead old. According to traditions, the funeral of Mongolia consists of many different rituals. When families have relatives died, the first thing the children will carry a gun crew outside shot three times to signal to the people in the village knew the family of the deceased. Descendants, the village people heard gunfire in the area will flock to the family to offer condolences, and see what help. The dead are children of the face, nose, limbs, new locker clean before returning to their ancestors. According to the traditions of Mongolia, the cleansing is complete, rinse face for the dead to be brought into the bed of the dead, that wash cloth was exposed to dry to burn. After washing the dead, they used a piece of wood to bring dead bodies placed between the house and the oldest son quickly that new latex (shaman only way) to celebrate “open design” put sugar way for the dead souls of the ancestors. This ritual is indispensable in any funeral of Mongolia. Will prepare a family tree it “security”, a knife and a chicken to celebrate with significant knife is the tool path, tree crossbow is a weapon to protect the dead on the road, chickens are directions. Latex dressing ceremony is complete, the drums, and continued to blow the last merit “open design” (line) for directions to the dead ancestors. Previously, the Mongolian often dead bodies hanging in between, also known as the horse put up “security log” to worship the spirits of the dead ancestors. Today, most of the lines they put the dead body in the coffin. After the ceremony, relatives, brothers, children and grandchildren to do Le Phung visit. Of Mongolia, when his parents died, a son, daughter must give parents a new outfit, a pig of wealth brought about less negative to eat. The eldest son is always assigned the first swine parents, followed by the third child in the family, then to Le Phung visit times of those close family and relatives in the . In the funeral of Mongolia, said he and his brother-in-law are the two most important people, so that before the to bear funeral, he and his brother-in-law is always to hire a master singing “devotees sister” to on behalf of the family outside the family held the funeral for the dead in accordance with tradition. In addition, the delegation he was carrying a pig, a pack of rice, 10 liters of wine, 3 boiled eggs, a plant money to to Le Phung visit for the dead carried away. As her children villages each carry a pack of rice, a bottle of wine, a bunch of incense to to Le Phung visit for the dead. Depending on the economic conditions of the family that they held the funeral for the dead big or small. The funeral to Buffalo to have surgery usually lasts from 3-4 days with a lot of different ceremonies such as: probably “hang light enough” (the gifts), “Nung Chan what” (inquiry holidays), “Tiu edge channel “,” bears the same “… everyone blows praise, drums sing all night to farewell the dead. Until it nearly daylight, children celebrate bring the dead out of the house and carried out the opening ceremony buffalo. Before carrying dead bodies out of the house, the family must ask a shaman ceremony to catch that horse out of the house, in the sense that the dead to pursue soul out of the house to later descendants peace do eat. Shaman, the family also had to ask two young birds spike dug, plum branches beating around the house with meaning chasing ghosts out of the house. Dead bodies being carried out of the yard killing a buffalo, the eldest son is always driving buffalo over to the dead. Before the ceremony, the drug boss to celebrate, then that boss, took a linen cord attached to the rope and buffalo buffalo delivery ceremony for the dead carried away. Uncle or brother-in-law on behalf of external parties who killed buffalo in the sense that he is an external representative for the offering on behalf of the dead. Buffalo finished killing people bring to open, and then processed into the ceremony nine to make shaman rituals for the dead and processed food in the funeral, the rest they divided into small pieces divided for families who sacrifice to serve visited to thank. 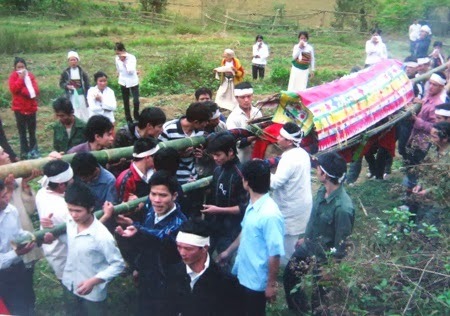 After lunch, about two or three hours, the children carry the dead to burial, then people go back home. In the first three days of early morning and late afternoon, that had brought the dinner, baron handed to die business with new meaning people like the child he did not eat, the first day the children have to bring rice assigned to the dead. Buried for three days, the children focus carry a hoe, a shovel renovated and fenced the grave for the dead beautiful open the yen. The dead are 12 days, the children of the grave to welcome the dead souls visit again. After two years, the children organized ritual “PLI rush” to the dead away peacefully, after a few years, the family continues to celebrate “as post” (buffalo opening) is holidays last offered in the funeral of Mongolia. After worshiping “as being” children do not organize any ritual. Only to the holidays, the children of ritual organization they call the soul of the dead to visit their home.